I’ve been to Bare Burger a few times since it first opened in my neighborhood. 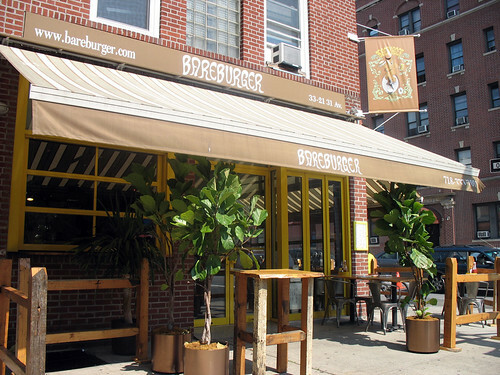 It’s kind of a fun and quirky place that proudly advertises its use of all-organic ingredients in its unique assortment of burgers. While I personally find their menu a bit too pricey on certain items to make it a place I frequent regularly, I have always enjoyed their veggie burgers - so of course I had to treat myself to another dinner here… for the sake of the blog. The cool thing about Bare Burger’s menu is that once you choose your meat (veggie for me, obviously – but they have some more “exotic” meats that my carnivorous friends quite enjoy, like ostrich and bison) you can then choose from an assortment of topping options, each with a name like “jalapeno express” and a suggestion of which type of burger the toppings go best with. For this review, I stuck with the basic “Original Bareburger” with Monterey Jack cheese, lettuce, tomato, raw red onion, and Bareburger special sauce. The veggie burger and the bun are both vegan, so ordering the burger without the sauce or cheese will make it completely animal-product-free. A couple warnings about the menu, though – some of the different toppings are not available on all burgers. I tried to order a veggie burger with the carmelized onions and cucumber mint yogurt and was told that this was only available with the lamb. I’m still not sure why they have this policy, as it seems like it would be as easy to put those toppings on any patty, but alas! Second warning: Unlike most restaurants, fries are not included with the price of your burger here, which is why I consider it a pricier-than-I-normally-prefer place even though at first glance it doesn’t seem to be (add an extra $3 to each price if you want fries with your meal, then you’ll see what I’m talking about). But you should order the fries anyway, because they are really quite good – and they have a great selection of dipping sauces, and I’m a sucker for fries with good chipotle mayo. The milkshakes are also delicious, but definitely not cheap either. But like I said, I was treating myself to this dinner for the sake of the blog. And it was definitely worth it. My burger was delicious, hearty and healthy – not trying to be mock-meat, but with more substance than vegetables simply mashed together. The Bareburger special sauce is quite tasty too, although I felt like there should have been a bit more of it, or maybe the patty itself could have been a bit juicier. The bun was excellent – I’ve tried Bare Burger’s brioche bun before, but prefer the 7 grain (and recommend it to others). I chose the “Original Bareburger” toppings for this review, but I would like to come back and do a proper review of some of the other ones I had tasted in the past before I started this blog – I recall the Jalapeno Express and the Avocado California both being excellent, and a little more exciting than the basic “Original”… as is to be expected. Is it “the best burger in town” as their restaurant claims? Well, not quite… but it’s certainly one of the best in my neighborhood (I hear they are opening a second location in Manhattan soon as well). And it’s refreshing for a place that is famous for its burgers to incorporate veggie options so easily into its menu (yes, options plural - they also offer a portabella mushroom). This is far from a generic frozen veggie patty tacked onto the menu to make a few bucks off of vegetarians who get dragged into the restaurant by their meat-eating friends… this is actually a place I recommend to other vegetarians. EDIT: multiple locations around NYC, and around the country now! Treating yourself for the sake of the blog...how selfless! This looks like a good place for both me and the bf; thanks for the review! It looks super-tasty, but I think I would have gotten mad when they told me I couldn't have the toppings I wanted. As a vegan, I've grown pretty used to making special requests, and they're almost always accommodated with no problem...a place that doesn't accommodate would go on my bad list. But that being said, the burger looks tasty! Hey there! I'm back again. I just awarded you the Most Versatile Blogger Award...come on over to my blog for details! I don't go out of my way to eat burgers that I can tell will be terrible, because, well... who would really want to do that? And I don't make any money off of this website so it gets expensive eating all these veggie burgers. So I'm not really inclined to pay for a burger that I think I will hate! 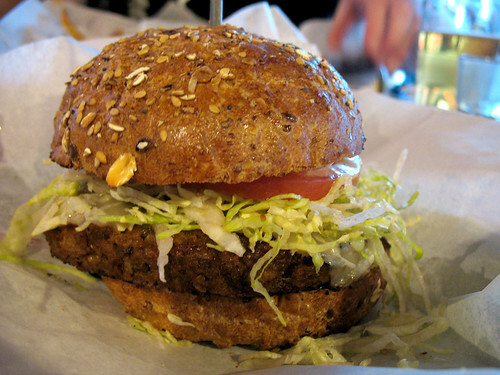 Just had the Bareburger veggie burger yesterday and thought it was fab. My question is: is it made with organic soy? I've been told that non-organic soy is really bad cuz it's basically the most GMO'd crop there is, controlled by Monsanto (seed, pesticides, etc). Plenty of info online about this. If you look at the Bareburger menu, it says "organic" in front of most of the burgers (or "free range" for the chicken) but not for veggie burger (just says dairy and nut free after it, but no indication of organic). My hunch is that it's not organic, which is kinda sad, cuz I like the place and I like how the veggie burger tastes. If you know or find out any info please post. Thanks! Ali, I have been to Bareburger recently. I absolutely love burgers and thought this place was delicious. I am glad you posted information about the veggie burger. Though I am a meat eater, I like to incorporate a vegetarian diet in whenever I can, to maintain a healthy lifestyle. I have found that many veggie burgers are as you pointed out, veggies mashed together. They have no taste or taste like cardboard. It's hard to find a good veggie burger and I can not wait to give this one a go!